Fiona Marshall* is a lecturer in Agricultural Development. D.S. Bhupal is a reader at the Agricultural Economics Research Centre, Delhi University, India. Ascot, Berks SL5 7PY. E-mail: f.marshall@ic.ac.uk. Of India's population of more than one thousand million people, 35-40 percent currently live in cities. This proportion is expected to increase to about 60 percent by 2025 (Brockerhoff, 2000). The creation of employment has not kept pace with the growth of urban populations. As a consequence, the traditional pattern of poverty incidence is rapidly shifting from rural to urban areas. Every day an estimated one thousand people come to live in Delhi alone. These include migrants from poorer states such as Uttar Pradesh and Bihar (National Capital Region Planning Board, 1996). Migrants move to the relatively inexpensive fringe areas of cities, where clusters of slums are emerging. These environments are characterized by poor sanitation, lack of water and electricity services, and substandard housing. Urban food security is becoming a matter of increasing concern and urban poverty is reflected in the nutritional status of the people. Households in large cities in low-income countries spend 50-80 percent of their incomes on food (PCC, 1990, cited in Mougeot, 2000) and nutritional deficits in macronutrients and essential micronutrients are common. Demographic and economic expansion of cities, through processes such as migration and industrialization, tend to be accompanied by spatial expansion, resulting in encroachments by cities upon adjacent peri-urban areas. At the same time, areas that were earlier distant from the city and rural in character will subsequently start falling within the cities' reach or "band of influence". Typically, increased interaction with and access to the city economy, in terms of capital, labour (public and private) goods and services will subsequently trigger the transformation of the rural to peri-urban areas. The rural-peri-urban-urban continuum itself is thus dynamic in nature and the changes will be more marked around cities that are rapidly urbanizing or growing both economically and spatially, as compared to slower-growing or stagnant urban cores. India's agricultural policies have focused strongly on rural areas, aiming to achieve self-sufficiency in food production and to reduce rural poverty. Accordingly, urban food needs are expected, explicitly or implicitly, to be fulfilled by production in rural areas. With the emphasis on rural agriculture, the positive contribution that production closer to the cities can make has hardly been acknowledged. However, the role of urban and peri-urban agriculture as a major source of produce, a means of improving food security and enhancing the livelihoods of poor producers, is increasingly described in the literature (Bakker et al., 2000). Much of the evidence to date has been gathered from African, Latin American, Caribbean and some Asian and Eastern European countries. The Indian subcontinent has been underrepresented, reflecting a neglect of this issue by the international and national research communities. Indeed, in India, government policies, scientific research communities and non-governmental organizations (NGOs) have shown little recognition of urban and peri-urban agriculture (UPA). This article assesses the nature, extent and significance of UPA in the context of Delhi, a rapidly growing city in the northern plains of India. This work stems from an interdisciplinary research project funded by the British Department for International Development. The research was based in Delhi and Varanasi and was led by Imperial College in partnership with several Indian universities1 and governmental and non-governmental organizations during the period 1997-2000. Based on satellite image: 19 February 1998, IRS-1C, 25 metre resolution, swath 140 ¥ 127 km. Map digitized by RMSI, adapted by D. te Lintelo. In order to describe the extent of agricultural land use in and around contemporary Indian cities, digitized satellite imagery was obtained from the National Remote Sensing Agency in Hyderabad and processed according to appropriate land use classes. The land use patterns in Delhi in February 1998 are shown on the map. Within the boundaries of the National Capital Territory of Delhi (Delhi NCT) there are both urban and more `rural' areas. However, the actual conurbation stretches beyond the administrative boundaries in southern, southeastern and eastern directions, including most prominently the towns of Gurgaon, Faridabad, Noida and Ghaziabad. The main urban agricultural area in the core area of the city of Delhi is the floodplain along the Yamuna River. The area beyond the urban conglomeration of "Greater Delhi" is still predominantly agricultural and within the wider Delhi NCT (located to the north, northwest and west between the centre of Delhi and the towns situated on its peripheries) lie important but diminishing agricultural areas. The satellite image also clearly depicts the wide extent of agricultural land use in and especially around the city: 44 percent of the land area shown is used for crop production, fallow land, plantation or grassland while 17 percent consists of built-up areas. The pervading characteristic of peri-urban areas is the concentration of poor people, consisting of inner-city as well as rural migrants and/or marginal local farmers. Fringe areas in Asia are characterized by densely populated intensive smallholder agriculture (McGee, 1991, cited in Druijven and Singh, 1994). The road and railway networks are reasonably well developed, facilitating access to nearby urban markets. The additional availability of cheap migrant labour forces as well as highly qualified urban professionals makes peri-urban areas valuable locations for national and international industries. Natural resources are under increased pressure in the peri-urban areas because of the use of land for, inter alia, clay pits, quarries, sewage disposal tanks and garbage dumps, and as a result of air and water pollution from local industrial and urban sources (Druijven and Singh, 1994). The livelihoods of the poorest inhabitants of the rural-urban fringes of many cities in developing countries are adversely affected by problems of land and water degradation (Hardoy, Mitlin and Sattethwaite, 1992, cited in Druijven and Singh, 1994, p. 114) and natural resource degradation in general, including air pollution stresses. Urbanization and industrialization affect agriculture in the peri-urban areas, as population pressure from the city results in changes in land use - from agricultural to urban land use, be it for housing, commercial, industrial or other purposes. Where the land use remains agricultural, cultivation practices change. Access to urban ready markets for agricultural produce and for seasonal labour open up the possibility of cultivating on a commercial basis high-value, highly perishable crops such as leafy vegetables, replacing storable crops such as cereals and pulses. Industries and their derivative trade and commerce offer new labour opportunities for cultivators and agricultural labourers, resulting in changing occupational structures. The changing land use pattern in Delhi NCT is shown in Table 1. By 1996-97, agricultural lands (permanent pasture, cultivable wasteland, fallow land and net area sown) represented 41.7 percent of the total area while non-agricultural land had risen to 56.9 percent of the total. A marked decline in forested and agricultural areas is evident, as a result of urbanization pressures. The radical decrease in permanent pastures illustrates the process of sale and acquisition of village common lands, which traditionally had been important resources for poorer sections of the agricultural society, who used them for cattle grazing and the collection of wood for fuel. The data clearly indicated that agriculture was a major land use in and around Delhi. This led to detailed research activities at the village level to investigate the nature of agricultural production systems, identify primary stakeholders and assess the role of agriculture as a livelihood strategy for the poor in peri-urban areas. The first stage of this research involved identifying and collecting statistics for a set of 30 revenue villages concentrated in three clusters in southwestern, northwestern and northern directions in the fringe areas of Delhi (Figure 1). All these villages keep local land records, a task performed by the patwari, or land revenue officer. In addition, local statistics are recorded on population, general land use, cropping patterns and household land ownership. The researchers in Delhi approached the state authorities and gained support from the Joint Agricultural Directors to obtain access to these records. State extension agents joined the research teams and facilitated discussions with the patwaris, who provided insights into the village statistical records and agricultural practices. Firstly, all households were categorized into different landholding and non-landholding groups. A sample of 10-15 percent was taken from each of the landless and landholding groups of farmers, resulting in an average of 35 households in each of six villages located in northern and southwestern directions. A series of village household surveys was then carried out using a structured questionnaire. Statistical data2 collected for 30 villages regarding land use patterns confirm that while there is a wide variation in the extent to which villages are built up, agricultural land use is still a dominant feature in the fringe areas. On average, 10 percent of the land was built up; however one village was already using 29 percent of its land for buildings, whereas another used only 1 percent. Wheat, rice and great and spiked millet are cultivated on most of the agricultural land. Vegetable cultivation is also popular. On average, villages used 9 percent of their agricultural land for vegetable cultivation although the proportion varied widely, with some villages using up to 35 percent of the land for these crops. An important factor affecting both land use and cropping patterns is the access to transport networks for linkages with urban markets for agricultural produce, labour and capital. UPA can support livelihoods primarily through food provision, income generation and employment. In general, access to land and water is the prime condition for involvement in UPA (Nugent, 2000). In and around Delhi, the distribution of agricultural land is highly skewed. In Faridabad district, for instance, almost 42 percent of the landholdings were smaller than 2 hectares (ha) and two-thirds of the landholdings were less than 3 ha, commanding 40 percent of the total agricultural land (Census of India, 1991). The Government of India categorizes farmers with less than 1 ha of land as "marginal" and those with 1-2 ha as "small" farmers. Almost 20 percent of the survey households were landless and 42.7 percent had marginal or submarginal landholdings, thus fragmentation of landholdings was high. Leasing land or employment as agricultural labourers are the main means of becoming involved with agriculture and both are common. Several landless farmers leased in more than 2 ha, mostly paid for in cash at fixed annual rates. Among the landholders in the study area, leasing to and from other farmers appears to be a fairly popular method.3 Of the 211 survey respondents, 15 percent were engaged in leasing in or out land. Submarginal farmers with less than 0.4 ha of land did not tend to lease in land; rather, this group leased out land. Farmers with 0.4-1 ha of land reported more leasing in and out, and small farmers (1-2 ha land) also appeared to be actively engaged in this activity. However, most of the leasing activity was undertaken by farmers with more than 3 ha of land. Thus, although the distribution of land is uneven, with a large community of farmers cultivating small landholdings, access to land is not limited to these groups. Landless people are involved with UPA either as agricultural labourers or through the cultivation of leased in land. At the all-India level, 83 percent of the rural and 14 percent of the urban working population were involved with agriculture in 1991 (Census of India, 1991). In contrast, within the heavily urbanized Delhi NCT only 1 percent of the urban and 17 percent of the rural Delhi population were involved in agriculture as cultivators, labourers, fishermen, or in livestock, forestry, hunting, plantation and orchards, goat rearing and allied activities. In Alipur block the participation rate in agriculture averaged 22 percent,4 although this proportion was higher in less urbanized villages, "but not much more than 40 percent" (Bentinck, 2000, p. 101). In neighbouring districts such as Sonepat, 61 percent of the rural and 11 percent of the urban workforce were agricultural workers. In Faridabad 72 percent of the rural and 5 percent of the urban workforce were employed in agriculture (Census of India, 1991). In the six case-study villages of Rewla Khanpur, Jhatikara, Bajgera, Palla/Qulakpur, Hamidpur and Pachayra occupational patterns differed significantly among the more and less prosperous households (Table 2). 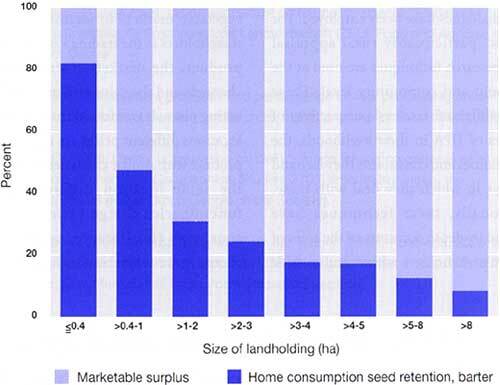 Whereas farmers with more than 2 ha of land have cultivation as their main occupation, small and submarginal farming households' strategies are often based on diversification. Landless households obtain employment as agricultural labourers or, importantly, cultivate leased in land. Source: Government of NCT of Delhi, 1998, p. 56-57. The number of days of involvement in agriculture as reported by labourers surveyed ranged from 100 to 270 days per year. On average, agricultural labourers were involved for 48 days in zaid/summer (May-June), 55 days in kharif/wet (July-October) and 52 days in rabi/winter season (October-April). Submarginal farmers' main occupation is cultivation, but in more than half of all cases government service jobs and agricultural labour for wealthier farmers provide the main source of occupation. Payments are generally in cash, although food is sometimes a form of payment. Thus, the study provides clear evidence that agriculture has an important function in providing employment for poor people in the fringe areas of Delhi. The actual benefits that large groups of small and marginal farmers will derive from cultivating these lands and, accordingly, the role of agriculture in their livelihood strategies, will be reflected in their choice of crops grown. How do farmers use their scarce resources of capital, labour, knowledge and, most importantly, land for the provision of food and income for the family? For the six case-study villages the overall picture is given in Figure 1. It shows that the agricultural activities have a fairly rural character, with dominant roles for cereal (such as wheat, millet and paddy) and fodder crops. Typical cropping systems are millet-wheat; millet-mustard; and paddy-wheat in the kharif and rabi seasons. These cropping systems depend on widely available irrigation facilities - in 1995-96, 89 percent of the land of Delhi NCT was irrigated (Government of NCT of Delhi, 1997). However, farmers opined that frequent interruptions in the electricity supply limited their access to irrigation, particularly for the poorer ones who cannot afford diesel generator sets for pumping. The Green Revolution's introduction of high-yielding varieties of wheat and rice has replaced traditional oilseed, pulse and coarse grain crops in Delhi NCT, Gurgaon, Faridabad and Ghaziabad districts. Whereas in 1970 145 000 ha of Gurgaon district were cultivated with spiked millet, this area had reduced to 56 000 by 1995 (Marshall et al., 2000). The trend in cropping patterns around Delhi is for traditional multicropping systems of local cereal crops, pulses and oilseeds being replaced by high-input high-yielding varieties of wheat and rice. One striking feature of the agricultural systems is that farmers are producing a large amount of green fodder crops such as berseem. These crops demand relatively little attention, allowing farmers to focus their efforts on cultivating other produce. Generally, fodder is grown for cattle feed, and a significant share is used for buffaloes and cows in dairy production. Also in urban Delhi, dairy farming takes place on public land, whether built up or not. Buffaloes can be found in densely populated areas, especially in the so-called urban villages but also in slums. In some of the Yamuna riverfront slums, dairy farms with 40-50 buffaloes can be found. Consequently, dairy production is often more visible than vegetable cultivation or other land-intensive agricultural activities in urban Delhi. Nevertheless, milk and its by-products are characteristically produced in peri-urban and rural areas, while the products are mainly consumed in urban areas (Bal, 1996; Singh and Rai, 1998). A spectacular early morning sight is offered by the daily "milk trains" entering the city with full milk churns attached to both sides of the train. Vegetable crops also have an important role. Vegetables grown in and around Delhi include cauliflower, cabbage, carrot, spinach, mustard (leaves), okra and tomato. In addition, a range of culinary herbs such as fenugreek and coriander are cultivated. The increase in the share of land use for vegetables is partly explained by proximity to the markets. Vegetables, flowers and dairy products are typically high-value and highly perishable products, which need to be produced where there is easy access to export, domestic and local markets. The move towards high-profit crops is a result of economies of scale: farmers aim to maximize their income from relatively small landholdings using their other plentiful resource: labour. Hence, whole families are engaged in intensive but small-scale horticulture. The relatively short growing periods combined with high inputs of irrigation water, pesticides, fertilizers and labour mean that it is possible to produce 3-4 vegetable crop harvests per year from a given plot of land. Nevertheless, farmers are generally keen to spread their risk through diversification of crops, and will not opt solely for high-profit vegetable crop cultivation, as vegetables are vulnerable to pest attacks, extreme weather and uncertain access to irrigation. 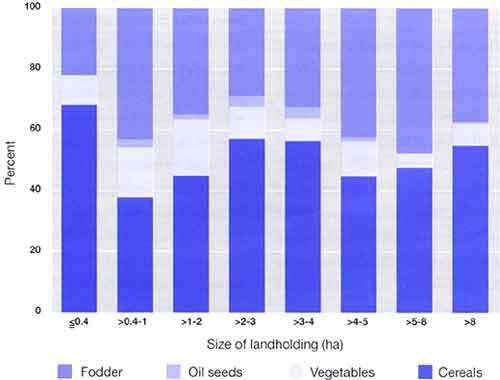 Although in absolute terms land under vegetable crop cultivation increases with larger overall holdings, among the marginal and small farmer groups the relative share is clearly more important: on average 15 percent of the gross cropped area is used for cultivating vegetables. Interestingly, among farmers with less than 0.4 ha of land (11 percent of the population) a breakdown in this trend was observed, with only around 10 percent of their land used for vegetables. This may be explained by high engagement levels in alternative occupations or by risk-averse/postponing behaviour, where the cultivation of risky vegetable crops may only take place after the minimum condition of feeding the household has been fulfilled. This last hypothesis is supported by the data in Figure 3. When total marketed cereal produce is set against the total production, it is clear that with increasing landholdings, the share of marketed surplus rises. Submarginal farmers retain a large proportion of their harvested cereals for home consumption, seed retention and barter and, as such, agriculture is a very important means towards fulfilling primary food needs for this poor group. In this preliminary assessment of the nature, extent and importance of UPA in Delhi, it has been shown that UPA is not only a dominant and dynamic land use but also an important livelihood strategy for poor people in India, providing families with employment, income and food. Although geographical locations may shift over time, the phenomenon of UPA will remain. This research forms part of a wider research programme led by Imperial College and designed to examine the nature and significance of urban and peri-urban agriculture in India. The environmental constraints associated with farming in these areas and the implications for the livelihoods of the poor and how these may be overcome are also being examined. Key complementary themes to be examined are outlined below. In addition to traditional research methodologies such as statistical analysis and structured questionnaires, a much wider range of techniques and links to policy dialogues have been employed. For example, participatory rural appraisal (PRA) research techniques are used at the household and community level. These have highlighted farmers' perspectives of the roles of UPA in their livelihoods, the opportunities and constraints they face and the ways in which they deal with these. Additionally, these techniques have provided in-depth accounts of the roles of different stakeholders within and outside the household units, including the significant contribution of women and children in food production and marketing. Agriculture around cities may improve the access of poor urban consumers to cheap and healthy food. This assessment of the extent to which food commodities produced in UPA areas contribute to fulfilling annual or seasonal demand in Delhi shows that there are large variations among different crops. For instance, the bulk of city dwellers' staple food requirements cannot be met by the UPA areas. In contrast, a majority (in terms of both volume and number) of selected vegetables in the major wholesale markets were found to originate from the UPA areas. The availability of such locally produced fruits and vegetables can contribute to solving highly prevalent urban nutritional problems stemming from insufficient intake of vitamins and minerals. Whether UPA produce enhances the remuneration of poor farmers and the access of poor urban consumers to food will also be affected by the structure and conduct of the marketing system. Field studies have been carried out in the main vegetable markets to identify the major stakeholders in the trading systems of UPA produce, the marketing strategies and channels and the value and price addition taking place. It was found that in different locations different prices are charged for a product with similar characteristics, and in the same location different market functionaries charge varied prices to consumers (for instance, a retailer may charge more than a vendor). In addition, in the same location prices fluctuate during the course of a day, with lower prices later in the day. UPA is subject to a wide range of constraints to production. Some, for example pest attacks, adverse weather conditions and timely access to inputs such as seeds and pesticides, are common to all agricultural areas, but there are also issues that are specific to this environment. An important emerging constraint is the effect of environmental pollution of the air, soil and water, which potentially compromises the quantity, quality and safety of food produced in UPA areas. Ambient air pollution levels have been measured and their impact on crop yields assessed in the UPA areas. The results give cause for serious concern. Additional research is being undertaken to assess the effects of air pollution on important crops, investigating the impact of gaseous pollutants on nutritional quality and the effects of heavy metal depositions on food safety. It is important to understand how production processes can be made more efficient and how official and unofficial support mechanisms can enhance the productive capacity of farmers. In view of the general lack of awareness about the significance of UPA, creating effective linkages with research and policy communities was of prime importance. Firstly, this required the identification of key stakeholders from government, private sector and non-governmental organizations. Secondly, in-depth analysis of the existing legal-administrative, policy and commercial environment of incentives and disincentives for UPA farmers was conducted. The policy environment in general is marked by a common dichotomy between urban and rural development administration and policies, leaving little scope for acknowledgement of the specific characteristics and needs of agriculture in the urban and peri-urban areas. Agricultural policies are primarily designed for rural areas, and are therefore not always compatible with the needs of UPA farmers. To bridge this gap, opportunities for linking up with activities and programmes were identified and the appropriate action taken. As a result, for instance, workshops were organized with the participation of PRA farming communities and state extension officers. Account must also be taken of other sectoral policies and dynamics having the capacity to affect UPA negatively, such as those relating to industrial siting, urban and regional planning, housing and the environment. For instance, the recent drive to relocate industries from urban to fringe areas in Delhi is expected to have a profound effect on local food production for the city. Building on the research and addressing the information needs already identified, the research partnerships are continuing in a follow-up project (DFID CPHP 7530 2000-2003) aimed at enhancing the integrity of the food chain through quality assurance mechanisms. Among its activities the project will assess the impact of air pollution on food safety and the nutritional quality of urban and peri-urban vegetable produce, undertake studies on the livelihoods of poor producers and consumers, investigate and analyse the institutional economics of marketing systems and policies, with the ultimate goal of developing beneficial market and/or public-sector-based interventions. This article is an output from a research project funded by the United Kingdom Department for International Development (DFID) for the benefit of developing countries. The views expressed are not necessarily those of DFID. R6992 Environment Research Programme (with reference to R7530 Crop Post Harvest Research Programme), project leader Dr Fiona Marshall. The authors wish to thank all our project partners for sharing their insights. Particular thanks for the material presented in this article are due to RMSI Limited, the NGO SEEDS based in Delhi, and to Dr John Stonehouse of Imperial College. Bakker, N., Dubbeling, M., Gundel, S., Sabel-Koschella, U. & de Zeeuw, H. 2000. Growing cities, growing food. Urban agriculture on the policy agenda. Feldafing, Germany, Zentralstelle für Ernahrung und Landwirtschaft (ZEL), Food and Agriculture Development Centre. Bal, H.K. 1996. Management practices and performance of milk processing units - a case study of selected cooperative sector units. Indian J. of Agric. Econ., 51(4): 736-743. Bentinck, J.V. 2000. Unruly urbanization on Delhi's fringe, changing patterns of land use and livelihood. Netherlands Geographical Studies 270. Utrecht/Groningen, the Netherlands, KNAG (Royal Dutch Geographical Society). Brockerhoff, M. 2000. An urbanizing world. In J.L. Garrett & M.T. Ruel, eds. 2020 Vision. Achieving urban food and nutrition security in the developing world. Focus 3, Brief 2. Washington, DC, International Food Policy Research Institute. Census of India. 1991. Delhi and Faridabad urban and rural primary census abstracts. New Delhi, Office of the Registrar General of India, Ministry of Home Affairs. Druijven, P.C.J. & Singh, R.B. 1994. Environmental degradation and its impact on livelihood strategies in the urban fringe of Delhi - some theoretical reflections. In R.B. Singh, ed. Disasters, environment and development. p. 355-367. Proceedings of the International Geographical Union Seminar, 9-12 December. New Delhi, Oxford and IBH Publishing. Government of National Capital Territory of Delhi. 1997. Delhi quarterly digest of economics and statistics. New Delhi, Directorate of Economics and Statistics. Government of National Capital Territory of Delhi. 1998. Delhi statistical handbook 1998. New Delhi, Directorate of Economics and Statistics. Hardoy, J.E., Mitlin, D. & Sattethwaite, D. 1992. Environmental problems in Third World cities. London, Earthscan. Marshall, F.M., te Lintelo, D.J.H., Wildig, Z., Stonehouse, J., Bell, J.N.B., Ashmore, M.R. & Batty, K. 2000. The impacts and policy implications of air pollution on crops in developing countries. Final technical report. London, Department for International Development, Environment Research Programme, R6992. Imperial College of Science Technology and Medicine. Mougeot, L.J.A. 2000. Urban agriculture: definition, presence, potentials and risks. In Bakker et al., p. 1-42. National Capital Region Planning Board. 1996. National capital region growth and development. New Delhi, Har Anand Publications. Nugent, R. 2000. The impact of urban agriculture on the household and local economies. In Bakker et al., p. 67-98. Singh, V. & Rai, K.N. 1998. Economics of production and marketing of buffalo milk in Haryana. Indian J. of Agric. Econ., 53(1) January-March: 41-52. 1 Banaras Hindu University (Varanasi), Jawaharlal Nehru University (Delhi), Agricultural Economics Research Centre (University of Delhi), Srishti (Delhi), Sustainable Ecological and Environmental Development Society (Delhi), National Institute of Urban Affairs (Delhi), Society for Heritage Planning and Environmental Health (Varanasi), International Institute of Environment and Development (London) and a participatory rural appraisal (PRA) team lead by Dr N. Mukherjee. 2 Land use data for four villages - Rewla Khanpur, Pindwale Khurd, Jhatikara and Hassanpur - for the year 1998-99 were not available, owing to incomplete records. Therefore data for the previous year were collected. 3 Also on the Yamuna floodplain in the centre of the city, farming is conducted on land leased from the Delhi Development Authority. 4 Mean proportion of persons employed in agricultural activities out of all working members of the household. Women are counted as half a worker, because they hardly ever work full time on the land. Rapid urbanization and a progressive shift from rural to urban poverty have important consequences for urban food security. Worldwide studies have shown that urban and peri-urban agriculture (UPA) may be able to make positive contributions as a local supplier of food to cities and can provide poor households with fresh food, income and employment. However, while generally the interest of international development research and funding agencies in urban and peri-urban agriculture is increasing, very little work has been carried out in India. Accordingly, this article provides a preliminary assessment of the nature, extent and importance of UPA in Delhi. It is shown that UPA is not only a significant and dynamic land use for poor people (particularly landless and farmers with small landholdings) living in urban and peri-urban areas in India, it is also a very important livelihood strategy, providing families with employment, income and food. And although geographical locations may shift over time, the phenomenon of UPA will remain. Nevertheless, UPA is rarely recognized by research and policy communities in India and hence raising awareness about its significance is a major challenge. Considering the agroclimatic, socio-economic and cultural heterogeneity of India, more case-study research will need to be carried out in various cities of different sizes. Further research should aim at integrating an assessment of the nature, significance of and constraints to UPU agriculture with an analysis of actual research and policy-support mechanisms. La sécurité alimentaire en milieu urbain est directement affectée par le phénomène d'urbanisation rapide, ainsi que par un glissement progressif de la pauvreté rurale vers la pauvreté urbaine. Des études de portée mondiale ont démontré que l'agriculture urbaine et périurbaine pourrait constituer une source locale d'approvisionnements alimentaires dans les villes et apporter, notamment aux ménages pauvres, un supplément de produits frais et de revenus, tout en procurant des emplois. Cependant, alors que, de manière générale, on voit s'accroître l'intérêt des organismes de recherche et de financement du développement international à l'égard de l'agriculture urbaine et périurbaine, les initiatives concrètes dans ce domaine sont demeurées très rares en Inde. Le lecteur trouvera dans cet article une évaluation préliminaire de la nature, de l'étendue et de l'importance de l'agriculture périurbaine à Delhi. On y voit que l'agriculture périurbaine est une manière importante et prometteuse d'utiliser les terres pour les populations pauvres (en particulier pour les paysans sans terre ou les détenteurs de très petites parcelles) vivant dans les zones urbaines et périurbaines de l'Inde. L'agriculture périurbaine constitue également une stratégie de survie de première importance, car elle est pour les familles une source d'emplois, de revenus et de nourriture. En outre, même si les lieux où elle est pratiquée peuvent changer au fil du temps, le phénomène de l'agriculture périurbaine est destiné à persister. Cependant, l'agriculture périurbaine n'est guère reconnue par les milieux de la recherche et les milieux décisionnels en Inde; c'est pourquoi aucun effort ne doit être ménagé pour les sensibiliser à l'importance de l'agriculture périurbaine. Compte tenu de l'hétérogénéité agroclimatique, socioéconomique et culturelle de l'Inde, il conviendra d'élargir la recherche, notamment sous forme d'études de cas dans des agglomérations de tailles différentes. L'approfondissement de la recherche devra viser à intégrer une évaluation de la nature et de l'importance, mais aussi des contraintes auxquelles est exposée l'agriculture périurbaine, parallèlement à une analyse des mécanismes concrets de recherche et de soutien des initiatives. La rápida urbanización y la sustitución progresiva de la pobreza rural por pobreza urbana tienen consecuencias importantes para la seguridad alimentaria urbana. Estudios realizados en todo el mundo han revelado que la agricultura urbana y periurbana puede desempeñar un papel positivo como fuente local de alimentos a las ciudades, además de proporcionar fruta fresca, ingresos y empleo a los hogares pobres. Sin embargo, a pesar de que, en general, el interés por la agricultura urbana y periurbana por la agricultura urbana de los organismos internacionales de financiación e investigación y desarrollo está aumentando, la labor realizada hasta el momento en la India ha sido muy escasa. Por ello, en el presente artículo se hace una evaluación preliminar de la naturaleza, el alcance y la importancia de la agricultura urbana y periurbana en Delhi. Se muestra como la agricultura urbana y periurbana no sólo constituye un uso importante y dinámico de la tierra por la población pobre (sobre todo, personas sin tierras y agricultores con propiedades pequeñas) que vive en zonas urbanas y periurbanas de la India, sino que también es una estrategia de sustento muy importante, que ofrece a las familias empleo, ingresos y alimentos. Además, aunque las localizaciones geográficas puedan cambiar a lo largo del tiempo, el fenómeno de la agricultura urbana y periurbana continuará. No obstante, este tipo de agricultura recibe escasa atención por parte de las comunidades investigadoras y políticas de la India, por lo cual despertar la conciencia de su importancia constituye un reto fundamental. Debido a la heterogeneidad agroclimática, socioeconómica y cultural de la India, habrán de realizarse más estudios monográficos de investigación de diferentes tamaños en diversas ciudades. Las investigaciones futuras deberían centrarse en integrar una evaluación del carácter, la importancia y las limitaciones de la agricultura urbana y periurbana en un análisis de los mecanismos actuales de apoyo de las políticas y la investigación.